According to the Smithsonian Institution, THE LITTLE CHAPEL THAT STOOD “is a wonderful work of children’s literature that balances historical fact with an uplifting message. Its powerful narrative makes it the perfect fit for a new Smithsonian OurStory module focused on a difficult anniversary.” So it became the feature book for the Smithsonian Institution’s OurStory interactive 9/11 program for schools and libraries. It was also chosen by the 9/11 Memorial Museum at the World Trade Center for their educational program where the book will be read and a film adaptation of the book will be shown on a giant screen to visitors. It is considered by both reviewers and teachers alike as the best children's book ever written about 9/11. In addition to many other honors, THE LITTLE CHAPEL THAT STOOD was declared an historic artifact by Duquesne University and was the subject of a doctoral thesis. The researchers went to various schools, asked the students a series of questions about 9/11 and left the book. They returned later with another series of questions. The thesis proved that after reading the book, school children talked about 9/11 less in terms of death and destruction, and more in terms of the courage and freedom of the American people. THE LITTLE CHAPEL THAT STOOD also inspired a New York City School Teacher to start an organization to advocate the teaching of the U.S. Constitution and the principles of capitalism in all New York City schools. 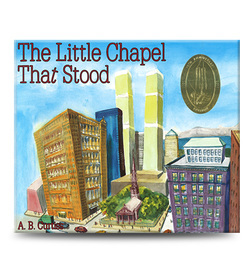 In a rather unusual event for a children’s book, THE LITTLE CHAPEL was read to the jury in the life and death trial of the 20th hijacker (Zacharias Moussaoui) because it made the point that America has never been a victim, not even on 9/11. America is victorious because it transcends its enemies. On that fateful day, everyone pulled together courageously, people risked their own lives to help disabled strangers down the Tower stairs to safety, and even small children waved "thank you" signs to passing fireman. THE LITTLE CHAPEL THAT STOOD reminds us that terror and war cannot win because they are insubstantial and temporary. But the freedom and courage in the heart of every American is abiding—as symbolized by this historic chapel that stood firm on 9-11. Alexander Hamilton and George Washington were members of this little chapel, built in 1776. Less than 100 yards from the Twin Towers, it miraculously survived and became the service depot for the rescue workers.